Sorry this competition has now ended! 2. Promotion Period: The promotion will run from 11:01 on 23rd February 2016 until 23:59 on 25th February 2016. 3. 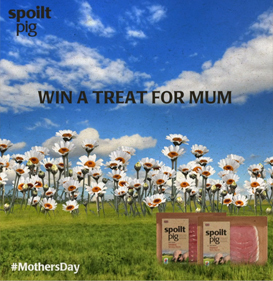 To Enter: go to facebook.com/spoiltpig and count the number of Daisies in flower in the promotional post picture. Entrants are required to ‘like’ the promotional post, state their guess as to how many Daisies are in bloom in the picture as a comment on the post, including a mandatory #spoiltpig within their comment. 5. The Prizes: A box containing 1 x pack of spoiltpig smoked streaky bacon, 1 x pack of spoiltpig smoked back bacon and 1 x pack of spoiltpig unsmoked back bacon. Only 1 prize available. 7. Winner Selection: Within 1 working day of promotional draw closing date, there will be a random draw from all correct guesses which comply with the terms as stated above, received. In the event that no one should correctly guess the number of blooming Daisies in the picture, the winner shall be drawn from those guessing closest to the correct amount. 8.Winner Notification: Winners will be notified within 1 day of the draw by email and will be asked to respond confirming their address within 28 days of initial notification. Failure to do so will result in an alternative winner being selected from all valid entrants. 9. Prizes will be despatched within 4 days of winner address confirmation. 14. This promotion is in no way sponsored, endorsed or administered by, or associated with, Facebook. You understand that you are providing information to the Promoter and not to Facebook. The information you provide will only be used for fulfilment of this promotion unless you have agreed to its use for any other purpose. By entering the promotion all participants agree to a complete liability release for Facebook.